By using a filled Soul Gem at an Altar of Enchanting at the Arcane University, the Arch-Mage's Quarters inside the University tower, or Frostcrag Spire. Both follow the same basic procedure. 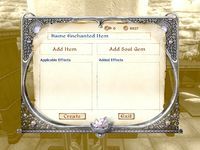 Choose an item to enchant, pick one or more magical effects to enchant into the item, define parameters on those effects, select a power source for the enchantment, and give the item a name. After this is all done, the process is complete. All enchantments on weapons are cast when a melee weapon makes contact with a live target, or when a bow or staff is fired. Such effects are charged; the weapon has a set number of charges depending upon the power source, and a certain number of those charges are used for each strike or launch depending on the effect(s) in question. All enchantments on clothing, armor, and jewelry work constantly. There are no charges to these items; the magic effect is permanent, and works as long as you wear the item. Magical staves are of the "cast upon use" variety, but it is not possible for you to create these (except for the custom one you get by following the Mages Guild quest line). A staff cannot be used as a melee weapon; "attacking" with the staff will cast its magical spell once. The menu for enchanting, using a Sigil Stone. See the Sigil Stone article for more information. See also the Effects and Magnitudes article for effects obtainable from Sigil Stones. Sigil stones provide an uncomplicated way to enchant weapons, armor, or apparel. Getting to them requires going through Oblivion Gates and, unless you're very stealthy or very fast, a good deal of combat on the other side. The available effects and the strength of the enchantment are determined when you grab the stone. Not all effects are possible. 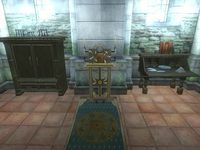 Enchanting with Sigil Stones provides effects not possible using Soul Gems at an enchanting altar, and vice versa; at high levels, Sigil Stones may provide more powerful enchantments than are possible at altars. Only one effect can be applied to armor, no matter the enchantment source, and only one to weapons if Sigil Stones are used; altar enchantments can apply multiple effects to weapons. An Enchanting Altar found in the Arcane University. The menu for enchanting, using an Enchanting Altar. See the Magical Effects article for a list of all effects and where they are available. Most Altars of Enchanting are located at the Arcane University. There are four inside the Chironasium, and one inside the Arch-Mage's personal quarters. You cannot use these unless you are a member of the Mages Guild with access to the Arcane University. If you have the plugin, there is one inside Frostcrag Spire, but you must purchase the magetallow candles and upgrade the altar before it can be used. The magical effects that you choose to use for enchanting can be acquired in many different ways (e.g. spells, racial abilities, Doomstones, etc.). If the effect is acquired from a spell only, it must be from one that you know and are able to cast. Therefore, if your only Frost Damage spell is too powerful for you to cast (e.g. it requires Journeyman level in Destruction, and your level is Novice/Apprentice) then you cannot choose Frost Damage as an effect. In such cases you must either become proficient enough to cast the spell or find another way to acquire the effect. However, some effects can only be acquired from spells. In addition, not all effects can be enchanted into an item (e.g. you cannot do a permanent Restore Health). The item you wish to enchant (weapon or armor). The magical effect qualities are different for weapons and for armor. An energy source, namely a Soul Gem filled with a soul, using Soul Trap. One or more Magical Effects to enchant your item with. For weapons, you can define the qualities of the magical effects. A name for the item. The base cost of the magical effect(s) multiplied by the magnitude determines the gold cost of making the item. With enough gold to pay for the item, click Done, and the item will be created. For armor and other worn items (rings, necklaces, amulets, clothing), only a single magical effect can be selected. The enchantment will provide a permanent effect, as long as the item is equipped. The strength of the enchantment is determined by the strength of the soul trapped in the selected Soul Gem. For weapons, multiple enchantments can be selected. In this respect, Sigil Stones are less effective at enchanting weapons. The strength of the soul trapped in the selected Soul Gem determines the weapon's total charge, i.e., the Magicka stored in the weapon when fully recharged. Each use of the weapon (e.g., each strike with a melee weapon or each arrow fired with a bow) drains a fixed amount of Magicka; the Magicka cost is determined by the strength of the selected enchantment(s). The maximum allowed Magicka cost for a custom enchantment is 85. Together, the soul strength and the enchantment Magicka cost determine the maximum number of weapon uses between recharging: uses = charge/cost. Enchanting a weapon with a Grand Soul (1600 Magicka charge) and selecting a maximum magnitude enchantment (85 Magicka cost) results in only 18 uses. If you choose a large magnitude (high Magicka cost) enchantment, you will need to recharge your weapon frequently, so being able to trap souls and carry multiple Soul Gems are recommended. Unlike Morrowind, the actual item that you are enchanting has no effect on the enchantment (for instance, a copper ring can hold as good an enchantment as a gold ring). This is balanced by the generally poor quality of enchantments across the board. This means that the best source of enchantments in the game does not come from Soul Gems. After enchanting, an item always has a health of 100%. For damaged items, this means that enchanting always repairs the item. However, if you are expert level in Armorer, it can instead mean that the health of an item is decreased from 125% to 100%. Therefore, enchanting can appear to decrease the health of the enchanted items. Simply repair the item to return it to 125% strength, and the health is restored. Additionally, any stolen item that is enchanted will remove the stolen tag, "laundering" it. If you have Black Soul Gems containing both Grand and Greater souls in your inventory, only those with Greater souls will be available to use at an enchanting altar. ? 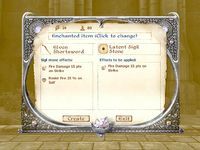 A list of suggestions for custom enchanted items can be found at Useful Enchantments. Enchantments add to the price of the item. For constant-effect enchantments, the increase in value is dependent upon the Barter Factor provided on the Spell Effects page. These equations also govern the value of most (but not all) standard enchanted items in the game. All enchantments on clothing, armor, and jewelry work constantly. Only one effect can be added to any piece of apparel. The level of the Soul Gem used to create the item determines both the magnitude of the spell effect and the cost in gold to create it. The Base Cost and the Barter Factor can be found on the Spell Effects page. The Soul Level is a numeric value of 1 to 5 corresponding to the strength of the captured soul. fMagicCEEnchantMagOffset is a floating point game setting which applies to all constant enchantments you make (default value: 5.0). The table below lists most of the common spell effects and the magnitude of the effect for each Soul Gem type. * Custom Feather enchantments are generally a poor choice, since the equivalent Fortify Strength enchantment is more powerful and has additional perks; see Feather vs Fortify Strength for details. ** A Petty Soul Gem and a Lesser Soul Gem produce the same results for the same price for these effects. ***Night-Eye, Water Breathing and Water Walking effects are flat cost effects and are not dependent upon the type of Soul Gem used. In other words, a Petty Soul Gem is enough to have these effects on an item. Usually destructive spells will be used to enchant weapons, and restorative/defensive spells will be used to enchant armor and other worn items. However, it is possible at the Altars of Enchanting to use any effect at your disposal to enchant any item. In this manner, it is possible to create cursed items, i.e., items that when worn do damage to the wearer. While you probably won't want to wear cursed items yourself, items with harmful enchantments can be used to nerf and assassinate opponents without incurring bounties. A Silence enchantment neutralizes spellcasting mages (such as Raelynn the Gravefinder), and any size Soul Gem results in the same permanent Silence effect. Any direct damage (Elemental, Health, Drain) effect can be added for 5 pts to clothing etc. When the NPC awakens, they will wear their inventory (at least one of every type, generally the strongest or best in case of a tie). Since most NPCs lack a hood, a zero-weight Mage's Hood is ideal for this. If the item is constant damage, the NPC will take damage until dead (and their empty attempts to heal themselves have failed). Other damaging enchantments will subtract a fixed amount from the related attribute: e.g. Damage Strength 5 pts. will drop Strength by just 5 points. You can use a "Robe of Rust" or any other item enchanted with Disintegrate Armor to damage your own equipment and then repair it, in order to train your Armorer skill. Just put the item on and take it off again repeatedly. You can do so even without exiting the inventory screen. For Dark Brotherhood quests, location still matters; if you use this to kill someone in a public place, you will not get the incentive bonus. Whether you're detected pickpocketing or not, you won't get a murder bounty. This is the equivalent of using poisoned apples with more certain and immediate impact. Another benefit is that after they're dead, you can loot the corpse, take back the cursed item, and use it as many times as you want. Be careful when placing a cursed item in the inventory of an Essential NPC. If the NPC equips the item, they will take damage and fall unconscious every few seconds, which can cause problems in quests where they are involved. The easiest (but most expensive) way to recharge enchanted weapons is to pay for a recharge at the Mages Guild. Each branch of the Mages Guild has one member who will provide recharging services, as listed under Other Services. This costs 1 Gold for every unit of charge. Unless you're rolling in cash, or the charge required is very small, this method of recharging can be prohibitively expensive. You may also purchase filled soul gems from various merchants in the game for roughly one quarter the cost of the recharge fee (see Soul Gem costs for details). The drawback of this approach is that merchants will only have a limited supply of soul gems at any time; you may need to wait a week before they restock. Varla Stones can be used to recharge all the magical items in your inventory. A list of all the Ayleid ruins that contain Varla Stones is provided on the Varla Stone page. Once you have one in your inventory, activating it will fully charge all enchanted weapons and staves in your inventory. Each stone is worth 1000 gold, but it isn't wasteful at all considering that this is far less than what you'd spend on those same recharges at a guild. Keeping one or two Varla Stones in your inventory may be a wise thing in case your trip to Oblivion doesn't go entirely according to plan and lasts longer than you'd wish. Varla Stones are not to be confused with the smaller, cyan Welkynd Stones, also found in ruins, which can only be used to refill your Magicka. Welkynd Stones are much more common than Varla Stones. Both Varla and Welkynd Stones are unique, non-random, non-leveled items and don't respawn (the only exception being the Varla and Welkynd Stones in Vahtacen, which are random in number but still not respawning). By far the easiest and most reliable method of recharging is to capture creatures' souls in Soul Gems and use their energy to recharge your weapons within your inventory. This method is made especially effective if you acquire Azura's Star, an infinitely reusable white grand soul gem that can easily and reliably be filled with Soul Trapping spells or enchantments. Note that it is more advisable to use a spell to trap souls than an enchantment, since it's possible for a weapon with a soul trap enchantment to run out of charges before you're able to trap a soul to refill it. Further tips for collecting souls are provided on the Soul Trap article. This page was last modified on 27 September 2018, at 06:04.